The latest games' sales were super-effective! Twenty years since the release of the original Pokémon Red & Blue, the pocket monster phenomenon is still breaking records. Nintendo announced today that the series' latest entries, Pokémon Sun and Moon, sold an astounding 3.7 million copies in the Americas in just two weeks, making it the fastest-selling game ever published by Nintendo in the region. Sun and Moon's sales shatter the company's previous record holder, Pokémon X & Y, by an increase of almost 85%, Nintendo says. Released in 2013, Pokémon X & Y has amassed 15.64 million sales to date worldwide - a figure Pokémon Sun and Moon appears to have already passed a quarter of in its opening fortnight. It's not just the Americas that are catching 'em all. Reports say that 1.5 million copies of the newest Pokémon game have been sold in Europe - 368,000 of them in the UK. In Japan, 1.9 million copies have also reportedly sold. So yeah, it looks like Pokémon Sun and Moon are destined to go down as a success for Nintendo and developer Game Freak. The question now is: what next? 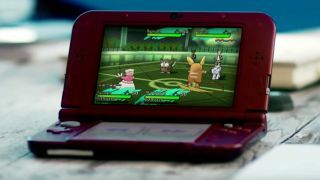 If rumors are meant to be believed, Game Freak may be developing a third version to go along with its newest generation of Pokémon games called Pokémon Stars. Third-entry Pokémon games are nothing new to the franchise. From Yellow to Crystal to Emerald to Platinum, there have been many re-releases of Pokémon titles with minor tweaks and exclusive content. What sets apart the rumored Stars version isn't that it's in development, but what it's in development for. If real, Pokémon Stars would be released on the upcoming Nintendo Switch, making it the first "core" Pokémon game put on a console rather than a handheld. We think the franchise is ready for its console debut, especially on a machine as portable as the Switch, though we also feel cagey about the Switch relying too heavily on re-released games. Either way, there's no doubt that the Pokémon craze - amped by Sun and Moon's massive sales and the cellular sensation that was Pokémon Go - won't be going away anytime soon.